Stone Cabin Press, 9780988414808, 320pp. "from the heart, honestly and without frills . . . a timeless tale" 5-Stars - Clarion Reviews - A ForeWord Reviews 2012 Book of the Year Finalist - In the fall of 1918 infantry sniper Joshua Hunter saves an ambushed patrol in the Bois le Pr tre forest of Lorraine . . . and then vanishes. Pulled from the rubble of an enemy bunker days later, he receives an award for valor and passage home to Hadley, a remote hamlet in Virginia's western highlands. Reeling from war and influenza, Hadley could surely use a hero. Family and friends embrace him; an engagement is announced; a job is offered. Yet all is not what it seems. Joshua experiences panics and can't recall the incident that crippled him. He guards a secret too, one that grips tight like the icy air above his father's quarry. Over the course of a Virginia winter and an echoed season in war-torn France, The Fallen Snow reveals his wide-eyed journey to the front and his ragged path back. Along the way he finds companions - a youth mourning a lost brother, a nurse seeking a new life and Aiden, a bold sergeant escaping a vengeful father. While all of them touch Joshua, it is the strong yet nurturing Aiden who will awaken his heart, leaving him forever changed. 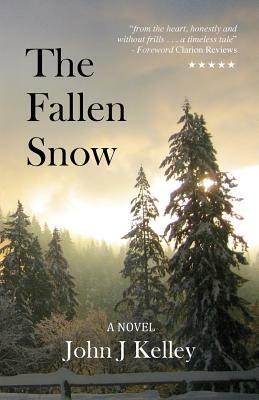 Set within a besieged Appalachian forest during a time of tragedy, The Fallen Snow charts an extraordinary coming of age, exploring how damaged souls learn to heal, and dare to grow. Like so many returning from so many wars, Joshua is not whole, in body or in spirit. He is one of those, as his sergeant warned, for whom the war "will leave scars that never heal." Just how deep those scars run is the mystery woven into John J Kelley's touching period novel about a veteran seeking to deal with memories of his service. Half of the story is told in flashback... (though) there is more to The Fallen Snow than a wounded combat veteran haunted by the horrors of war, mourning for lost comrades, or suffering survivor's guilt. These emotions are part of the fabric that makes up the main character's personality and story, but Kelley's stricken hero, Joshua Hunter, holds within his heart yet another secret: The memory of a forbidden love that few in his native Appalachian town would suspect, let alone understand or accept. In a gripping tale of self-exploration and atonement, Kelley's debut skillfully evokes the unpredictability of life in 1918 through mesmerizing descriptions and fully realized characters. Joshua Hunter volunteers to fight in the Great War to escape his rural Virginia home, becoming a respected sniper in wartime France. Unfettered from his close-knit Appalachian community's expectations, he develops a growing quietness and strength despite the ugliness of war. Returning home a crippled war hero, Joshua feels the old familiar expectations becoming more onerous. And even an engagement and job offer cannot erase the past, the echoes of war, and a well-guarded secret. Kelley's novel is emotionally complex and brimming with grit. Told in a plainspoken manner through parallel story lines—the present in Appalachia and the past in France—this story will appeal to readers of coming-of-age stories with a historical bent.